I just returned from a magical week in Norway with my husband and my parents. We wanted to see the land of our ancestors. My 3rd great-grandparents left Norway in the 1870s to start a new life in America. I didn’t realize I would fall in love with this beautiful country and feel such national pride as I lay claim to my Norwegian heritage. Soon I will share plenty of tips and details about how to experience Norway. Today, I want to captivate you with the majesty of this country that stole my heart. Please enjoy these postcards from Norway. Undredal, Norway. A small town on Aurslandfjord. Norwegian Folk Museum, Oslo, Norway. Sognefjell Pass, Jotenheimen National Park, Norway. Grass roofs are common on many homes in Norway. A residential street in Bergen, Norway. The land my great-great grandfather likely farmed. Kjorven, Lunner, Norway. Stave Church at the Norwegian Folk Museum. 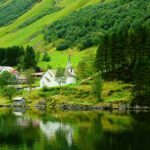 Only 29 stave churches remain from the 12th and 13th century when Christianity came to Norway. Kjosfossen Waterfall, near Myrdal, Norway. The Flamsbana Railway stops for passengers to visit this captivating waterfall. Sculptures by Vigeland. Over 200 sculptures capturing human emotion can be found in Frogner Park, Oslo, Norway. View from Kaupanger, Norway, on Sognefjord. A typical valley in Norway. Sheep cut the grass all over the steep mountains in Norway. View from the train station of the Flamsbana Railroad, Myrdal, Norway. Mike shared your link with me… It looks like you all had a grand time, and I have to say, the photos are beautiful and the Norwegian landscape is amazing! Thanks, Pete! Mike is a pretty great photographer. 🙂 We had such a great trip and I’ve never seen anything as beautiful as Norway. 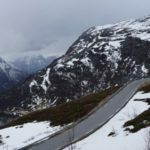 We might well be going to Norway next summer (2016) – these photos make me REALLY want to go! I hope you can go, Katja. Posting more tips in the next few weeks but it was a beautiful country and I would LOVE to return! Wow! Stunning photos. Norway is still very high on our list. Hopefully we’ll make it there in 2016. Norway looks absolutely stunning. Thanks for sharing these photos. Beautiful pictures. Norway is one place I’d absolutely love to visit – it looks fantastic for a great family holiday. The pictures are stunning! You’re making me want to visit Norway! These pictures are amazing! What a glorious trip to your roots! Wonderful photos! I had my husband take a look with me–great fun reminiscing over our trip to Norway a few years back. We stayed in an apartment rental very close to the residential street you posted in Bergen. We loved Bergen so much that we decided to name our son after the city! I can see how you could fall in love with Norway enough to name a child after it! Thanks for sharing. It is a beautiful, amazing country! have more of them? Just curious. Hi Maxi. My husband took these photos and I have a lot more of them. Had to limit myself to 20. 🙂 I will be posting more in the coming weeks as I share more details about the trip. Love the pictures. We have the same picture of the wooden Viking from our trip this past August. We loved the Norwegian Folk Museum too. It looks like it was a bit colder when you went. Great pictures! I visited Norway years ago and your photos brought back fond memories. I especially loved, loved, loved Frogner Park!